It has been a few days since my surgery, and I’m happy to report that I made it through. Thanks to those who have written to me. I’ve been a bit slow on responding but I appreciate your concern and warm wishes. Thanks to Katie S. for that sweet hospital gown, and Tiffany for the nice tea, and Maytal for the lasagnas and banana bread (which made the hubs very happy as well), and the Rock-it Promo team for all the fun products and DVDs, and everyone else who has sent cards and nice things. Thank you! The surgery went well, from what I can tell. I didn’t get to actually speak to my surgeon after I woke up, but I assume if something had gone terribly wrong, I would have been informed. I don’t remember too much, because the anesthetic tends to do strange things to your memory, which is probably for the best. I do recall crying like a baby when a nurse started my IV through my wrist. I’m not sure why she chose my wrist, but she poked me several times and the pain was way more severe than I expected. I was in the middle of talking to a surgical fellow, when I realized I was in pain. So I did what any normal adult woman would do, and I pulled the blanket over my head and sobbed. Lately I have realized that my hospital crying sessions are about a 50/50 mix of emotional and physical pain. The instant my brain receives the signal that I am again in pain, however small or fleeting it may be, I am overcome with the realization of how much my body has been attacked and how much I have gone through since finding that lump, and the sheer absurdity of the entire thing. The tears come more from exhaustion than from anything else. I am tired of the pain, I am tired of feeling like some sort of botched science experiment. The tears are just inevitable at this point, and I let them flow freely, as they wish. I also remember the mask being lowered onto my face, which I do not enjoy, as I am highly claustrophobic. Upon realizing this, the kind anesthesiologist did his drug magic and gave me something to knock me out before the real knock out. I made a comment about how ugly the ceiling was and how there should be something more pleasant to stare at while you wait to lose consciousness, and then that’s the last I remember. Lights out. I was not in the hospital very long this time around. I wanted to go home that evening, and I believe I said to the nurse, “Get me the eff out of this place.” So she got the approval for me to be discharged and I didn’t have to sleep in the hospital and hear the chemo machines beep all night. A sound which now triggers a queasy feeling inside whenever I hear it. I’ve been doing well at home. As people had told me, the recovery for this surgery is definitely much easier than the first, which I’m very happy about. I was only on the heavy drugs for a couple days, and now the pain is tolerable with no drugs, as long as I don’t move around too much. I have my stupid surgical drains, which I hope to get removed by my home care nurse in the next couple days. If you have no idea what drains are, consider yourself lucky. Don’t google it. It’s about as gross as it sounds. The weather finally seems to be getting a bit nicer outside. I went for a walk today. And by a walk, I mean a few steps out my door and then back. But I got to feel the sun for a bit, which was nice. It’s days like these that it’s best for me to stay away from social media, where everyone is making grand proclamations about their love of springtime and all the fun things they’re doing today. It’s hard to relate to everyone else when you have tubes hanging out of your body. Right now, I am most looking forward to getting clearance to take a bath. You don’t realize how wonderful something like taking a simple shower or bath is, until that privilege is taken away from you. The little things. I don’t have a current photo to post because I am not feeling particularly photo-friendly at the moment. But posts that are all text are a bit boring, so I’ll leave you with this old photo of me. 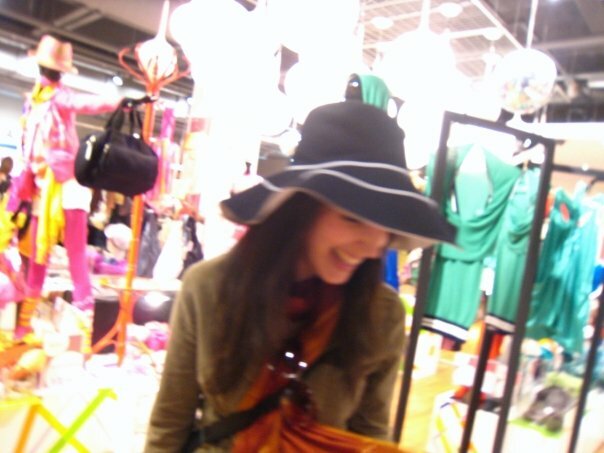 At some department store, in Paris, laughing over something that probably wasn’t all that funny. I hope to be doing this again sometime in the future. I went to high school with your sister. Her and I weren’t particularly close but she posted a link to your blog on Facebook and I’ve been following it for the past couple months. I often think about you and pray for your recovery. Although we’ve never met, you have touched the hearts of many, including mine and my parents’. Two weeks ago, we got unfortunate news that my mom got diagnosed with the breast C word too (I’m still in denial and refusing to use the actual word). Your blog has been incredibly helpful… Knowing that there is someone out there who is fighting as well and reading about your experiences makes us feel slightly less alone. Your blog touches people’s lives in many ways and what you are doing so much for so many of us. My thoughts are with you and your battle. You’re on your way to being a healthy girl once again! Don’t stop fighting, no matter how hard it might be at times. Thanks so much Maria! Glad the blog has helped. All the best to your mom. My comment, although not inspiring, is intended to let you know that at 35 I had to have a complete hysterectomy and I too, pulled the covers up over my head and sobbed for hours. We do what we need to do when we need to do it!! Stephanie – I have been following your blog and keeping up with you through your cousin Lauren Greenberg. I am so happy to hear that your reconstruction is over! Another milestone reached. You always mention how much you appreciate all that people have done for you – the cards, emails, texts, meals, gifts, etc. I thought you might want to know what you have done for me. Many times over the past few months, I have faced scary or stressful situations (of course, nothing even close to what you are going through). Things like encouraging my husband to start his own company, speaking in public to large groups of people, accepting consulting work that is way outside my comfort zone, etc. Some days I actually felt sick to my stomach. And you would pop into my head and I would say to myself “if Stephanie can do all of THAT I can surely do this!” You really helped me put things in perspective and reminded me that I have the courage to do these things. So, thank you! P.S. Jacob Greenberg, my all-time favorite kid, is here sleeping over at my house – he says hello! Dear Brave Surgery Warrior Woman! Yeah!! It is done! No more surgery! I had back-to-back knee replacement surgeries last year and kind of know what you feel like with the thought of another one looming and the drugs etc. But mine was not entering the scary world of cancer and now I have new knees and far less pain. Yeah!! Each day brings you closer to wellness and the reality of looking normal in your clothes and mind. It is a bright new future! !